This selection of contemporary art acquisitions, many of them recent additions to the Art Centre collection, takes its title and theme from Adrian Gőllner’s wry pseudo-Modernist installation documenting artists’ paint colours that have been “discontinued” by their manufacturer. Moving beyond the obvious ironies of planned obsolescence, the exhibition probes the beauty of ideological forces, incisively exposing the improbable, accidental and impractical. The works in Discontinued Colours share an artistic strategy of slippery conflation of literalism and layered metaphor. 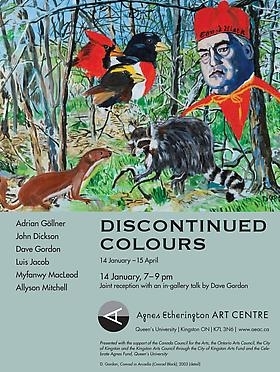 In addition to Gőllner, the show includes works by John Dickson, Dave Gordon, Luis Jacob, Myfanwy MacLeod, and Allyson Mitchell. Visitors to this show are warned that subtle concept-driven staging and utopian impulses at times give over to outlandish hyperbole and confusing affection for past certainties. The exhibition opens on Saturday 14 January with a reception from 7 to 9 pm. As part of the joint celebration with the concurrent Bernard Clark: Tattoo Portraits exhibition, Kingston artist Dave Gordon will offer an introduction to his acerbic portraits-in-the-landscape painting series featuring celebrities from Walt Whitman to Conrad Black. For further information, please contact Matthew Hills at 613.533.2190.